For retiree accommodation, a standard residential tenancy can outperform a retirement village in pure financial terms. At the 7 year mark the retirement village industry average occupancy period, the example below shows the retiree in a residential tenancy is $241,471.00 dollars in front of the retiree in the retirement village. Such is the upfront pain in the Deferred Management Fee model used by the industry, it takes over 17 years for the retiree in the retirement village to draw level in financial terms. There are aspects to life in a retirement village the retirees value that do not have a definable $ value, on the flip side retirees must pay for facilities etc. that they do not use. The retirement village financial pain shows clearly in this table prepared by www.retvill.net , especially when it is compared to a standard residential tenancy. In the table below four different retirement village payment models are examined and compared. All are measured by the loss of capital value over the period of the occupancy. It must be noted that retirement villages generally offer recreational and social facilities to their residents together with conditional security of tenure. These are not generally available with a standard residential tenancy within the community. What is striking in the analysis however is the cost of this over and above the market driven cost of a residential tenancy generally. All retirement village examples have the common parameters of an $800,000.00 entry cost with a Deferred Management Fee rate of 36% drawn over the first four years of occupancy, devaluation of the refundable amount (entry price minus the DMF and held by the operator until departure) at a cpi rate of 2.5%pa, a maintenance charge of $150.00 per week at in-going with an annual cpi increase of 2.5%pa, a unit refurbishment charge of $50,000.00 at in-going with an annual cpi increase of 2.5%pa. Retirement village maintenance fees, devaluation of the refundable amount over the period of the occupancy and refurbishment costs are including in the analysis. The retirement village resident does not gain ownership of the property, only a lease or licence to occupy. The most direct comparison to this style of retiree accommodation in relation to overall financial impact is a standard residential tenancy within the general community. Residential Tenancy - Rental return to landlord 5% with a 2.5%pa capital gain. 3%pa investment return to tenant on their retained $800,000.00. RED - Deferred Management Fee calculated on the ENTRY price. 100% of the capital gain to the RESIDENT. GREEN - Deferred Management Fee calculated on the EXIT price. 100% of the capital gain to the RESIDENT. YELLOW - Deferred Management Fee calculated on the ENTRY price. 100% of the capital gain to the OPERATOR. BLUE - Deferred Management Fee calculated on the EXIT price. 100% of the capital gain to the OPERATOR. Residential Tenancy - $682,002.00 - A loss of 26%. RED - $428,628.00 - A loss of 55%. GREEN - $383,797.00 - A loss of 60%. YELLOW - $304,096.00 - A loss of 62%. BLUE - $259,264.00 - A loss of 73%. Residential Tenancy - $529,097.00 - A loss of 53%. RED - $331,865.00 - A loss of 71%. GREEN - $251,171.00 - A loss of 78%. YELLOW - $107,716.00 - A loss of 87%. BLUE - $ 27,022.00 - A loss of 98%. Residential Tenancy - $308,712.00 - A loss of 79%. RED - $ 89,055.00 - A loss of 94%. GREEN - $ 0.00 - A loss of 100%. YELLOW - $-167,128.00 - A loss of 121%. BLUE - $-259,354.00 - A loss of 117%. Perseverance by one retirement village resident has paid off for around 50 residents of a Victorian retirement village. Although not directly affected the resident took up an issue on behalf of those residents who were facing a large collective financial impost. Potentially in the order of two million dollars plus the matter resulted from a breach of law by the village operator. The Victorian State Government introduced new provisions into the Retirement Villages Act 1986 effective from July 1 2014. Section 19 of the Act made it mandatory for retirement village operators to provide a prospective resident with a Fact Sheet before executing a contract. For a period of approximately 18 months after July 1 2014 the village operator failed to meet this provision of section 21A of the Act. There is a legislated penalty in the order of $30,000.00 for each occurrence. For a period following the above the village operator issued fact sheets with a material difference to the contract. The fact sheet advised prospective residents they will NOT be responsible for the refurbishment of their unit on departure from the Terrace whereas the contract states that they WILL be responsible for the refurbishment costs. There is a legislated penalty in the order of $8,000.00 for each occurrence where a person knowingly issues a fact sheet with details contrary to the contract. June 2016 - The resident raised the issue with the Residents Committee who wrote and advised management of the problem. Village management subsequently advised the committee "We are checking the information contained in the Factsheet and Disclosure statement and will correct any information that is inaccurate as a priority". July 2016 - Management refused to release to the Residents Committee a copy of a fact sheet and a contract currently being issued to any prospective resident. The committee wished to ensure the matter had been corrected. August 2016 - The resident lodged a formal complaint with Consumer Affairs Victoria as evidence came to light that the matter had not been corrected. January 2017 - The resident subsequently lodged a complaint with CAV as there had been no follow up from CAV with the resident over the matter. The resident was advised that as they (the resident) was not directly impacted by the matter and was merely raising the issue in the interest of fellow residents, the resident was regarded as an informant rather than a complainant and therefore not entitled to any further information. April 2017 - The resident advised CAV that as a result of information provided to the State Government inquiry into Retirement Living residents could be facing a refurbishment cost in the order of $50,000.00 per unit, the potential cost to residents from the breach of law by the operator was in the order of two million dollars plus. The operator would receive the cash benefit of this two million dollars plus over time. The resident was advised in a telephone call with a CAV officer that the CAV priority in the matter was simply to achieve compliance going forward. May 2017 - The resident wrote to the Board of Governors and each member of the Board of Governors personally. Evidence had continued to come to light that the matter had still not been corrected and there was consideration of a merger with another organisation. The resident received no response to any of the letters. July 2017 - The resident wrote to the local newspaper providing background to the matter and seeking an article be published which may assist in obtaining redress. No article was ever published. July 2017 - The resident wrote a letter about the matter for insertion in the 'Letters to the Editor' section of the local newspaper. The letter was never published. April 2018 - The resident wrote to the new chairperson of the Board of Governors. A meeting was convened where the resident provided background to the matter, highlighted the breach of Retirement Villages Act 1986 by the organisation and the substantial financial penalty flowing to the residents from this breach. The chairperson advised the matter would be raised with the Board. The Board of Governors and upper management had been transformed following suspension of accreditation stemming from an influenza outbreak in the adjacent aged care facility in 2017. May 14 2018 - The resident raised the issue again directly with senior personnel from Consumer Affairs Victoria at a meeting of statewide retirement village residents held in Melbourne. 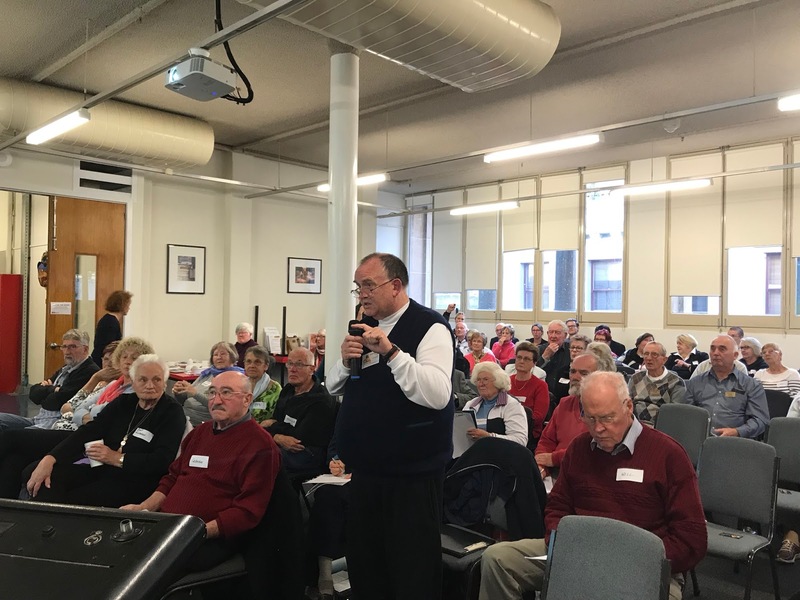 The meeting titled 'Make Your Complaint Count' was convened by the Housing for the Aged Action Group in conjunction with the Consumer Action Law Center, Residents of Retirement Villages Victoria and the Council of the Ageing Victoria. May 18 2018 - The new chairperson of the village Board of Governors issued a letter to current residents advising that amendments would be made to any relevant contract. Amendments would reflect the statement in the fact sheet that a resident would not be responsible to pay a unit refurbishment cost on departure. Future fact sheets would be amended to reflect the terms of the contract in that new residents would be responsible for the refurbishment cost of the unit on their departure from the village. Although a long drawn out process perseverance paid off for those residents who had entered the village post July 1 2014 saving them a substantial amount of money. Ed Note:- This matter epitomizes aspects of the retirement village industry. A breach of the law by an operator and then continuing knowingly of the breach, together with a failure of the regulator Consumer Affairs Victoria to enforce the law for which it was responsible and to take firm action on behalf of those people it is sworn to defend. Each of the above contributed to the matter continuing over a period longer than it should have and but for the perseverance on one village resident would still be happening. This was not about nickle and dimes, this was about dollars, big dollars, millions of dollars that would have been taken from retirees in contravention of the law. The law was clearly on the side of the retirement village residents. It was a lack of access to affordable, quick, decisive enforcement of the law that failed them most. Retvill.net. Retirement Living Residents Speak Out. Experts from Consumer Action Law Centre ran a session in partnership with Housing for the Aged Action Group, Council on the Ageing and Residents of Retirement Villages Victoria on Making Your Complaint Count for residents of retirement housing. "Increasing the number of complaints to Consumer Affairs Victoria will demonstrate the size of the problem and create momentum for CAV to act more strongly and push them to investigate the issues. We want to make retirement housing better by improving the regulation system – be part of the change and have your voice heard!" The workshop was aimed at residents of all types of retirement housing. In the image above a retirement village resident raises with senior staff from Consumer Affairs Victoria what the resident saw as a serious issue and that the resident felt had not received a serious enough response from the department. The operator of the village being discussed breached the provisions of the Retirement Villages Act 1986 and will gain financially in order of $2,000,000.00 as a result of this breach. Following a change in the law applicable from July 1 2014 the operator failed to issue a Fact Sheet for a period of approximately 18 months, a clear breach of the Act. Once the operator commenced issuing a Fact Sheet the prospective resident was advised through the Fact Sheet that they would not be responsible for the payment of the refurbishment cost of the unit they occupied on their departure from the village. (refurbishment costs can be as high as $80,000.00) The occupancy contract executed however stated that the resident will be responsible for this cost on their departure from the village, again a clear breach of the Act. The residents of the village will collectively be the poorer for this two million dollars despite a breach of the law by the operator. The resident believes the actions of Consumer Affairs in the matter was although to advise the operator to stop doing it took no action to remove the burden from the residents of the payment of this $2m dollars despite the clear breach of the law by the village operator. There is documentary evidence showing that the operator continued to breach the law despite the advice from consumer affairs that their actions were a breach of the provisions of the Retirement Villages Act 1986. From 30th April 2018, residents in dispute with other residents or with their village manager may seek mediation from the independent Disputes Settlement Centre of Victoria. The service is free. Consumer Action Law Centre, Residents of Retirement VillagesVictoria, Housing for the Aged Action Group and Council on theAgeing, are holding the workshop to help residents lodge a complaint and make the most of the mediation session. Complaint statistics drive change. By taking a complaint to mediation, you are also making sure the Government knows the issues that concern retirement village residents. RSVP to www.oldertenants.org.au/makingyourcomplaintcount or phone the Seniors Information Service on 1300 13 50 90 Monday to Friday 9:30am – 1pm. Booking is essential. WAtoday in an article by Rachel Lane of Aged Care Gurus advises retirees to crunch the numbers before entering a retirement village. "While it can be said that choice makes the transaction more complex, anytime you have choices there are factors to consider. If you are thinking about moving to a retirement village you should crunch the numbers, if the retirement village isn’t offering the payment method that suits you it doesn’t hurt to ask. Having different payment options means the same unit can sell for a vastly different price depending which option you choose. It also means that if you can’t afford one price you may be able to afford another, bear in mind too that, unlike aged care, the money you pay to a retirement village isn’t guaranteed by the government. Illawarra Retirement Trust has been providing payment alternatives since 1969. At their Harbourside village close to the beach in Kiama a one bedroom unit with “limited sea glimpses” sells for $257,000 as a donation, $534,000 as a bond, $380,000 with a 25 per cent exit fee or $461,000 with a 10 per cent exit fee. Or you can have a large three bedroom unit with sea views for $618,000 as a donation, $1,285,000 as a bond, $914,000 with a 25 per cent exit fee or $1,109,000 with a 10 per cent exit fee."